Joe Ready’s all but had it. He’s ninety-eight, he’s in the hospital, and he’s so horizontal that he could slide off this mortal coil at any moment. Joe’s not so horizontal that he doesn’t want to hear some stories about himself from his younger partner, Jimmy Cotton, though. Back in the day, Joe was the story teller, now it’s Jimmy’s turn. It could be called Joe’s living eulogy; it could be called a wake. Whatever it is, Jimmy tells it. Jimmy’s own story starts out with draft lottery numbers and watching a kid standing right beside him get a National Guard bullet through the brain during the infamous anti-war demonstration at Kent State, Ohio, in May of 1970, an event that ended him up at his mom’s condo in West Palm Beach, Florida. He was looking to escape the same something that all the drifting and lost souls in the 70s were looking to escape–but what he found instead was Joe Ready, living right next door. Joe takes Jimmy on a narrative journey through the 1930s and Joe’s career as a hunter of kidnapers. Starting off with a startling account of Katherine Kelly, Machine Gun’s better half, he takes Jimmy into a world where this Joe Ready guy seems far too intimately conversant with those who would have to be considered the “Moguls of the underground economy” of that era. Big time crooks and gangsters, in other words. Ready goes up against Ma and Freddy Barker, the Lindbergh kidnapers, Johnny Torrio, Meyer Lansky, and even Meyer’s Cuban buddy, Fulgencio Batista. Then Joe jumps his tale back to the late 1920s, when he was an actual L.A.P.D. cop, and got involved in the particularly horrendous kidnapping of a 12-year-old girl; the very same case, in fact, that started his hatred of all kidnapers, and especially those of children. 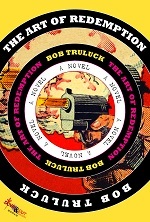 That particular story–and all of the kidnappings in this “fiction” / picaresque novel really happened; only the presence in the various cases of Joe Ready and later Jimmy Cotton, have been added by the author–involves a character who philosopher/novelist Ayn Rand, in one of her more abstruse moments, termed “the perfect man,” according to her Objectivist philosophy. Joe Ready’s version of the story kicks a lot of dust into Rand’s “philosophy,” as well as more or less explaining his own; at least with regard to kidnapers! Jimmy Cotton is back to his own voice explaining just how he and Joe “threw in together” at that very particular time in 1970, and with that dénouement, Bob Truluck gives us, the readers and lovers of modern noir, a new high point in the storyteller’s art, weaving a series of tales from three eras into a seamless blending of what, indeed, turns out to be The Art of Redemption. “Bob Truluck’s Joe Ready walked the edge of the law–on both sides–for 40 years, and he tells us his story through the eyes of a smart, drop-out kid named Jimmy Cotton who’s looking for something or someone to believe in as Nixon’s invasion of Cambodia in May 1970 sets off the chain of campus demonstrations that culminates with the Kent State massacre, where Jimmy himself almost bought the farm. The events that unfold are historically impeccable–Joe Ready was THERE–taking down Machine Gun Kelly for a voice on the phone; double-crossing Cuba’s dictator Batista and escaping the island, cracking wise to his sometime mentor, Meyer Lansky: but by the time the gunsmoke has drifted away, Joe Ready was always gone, too. Truluck’s dialog is unlike any I’ve ever read–BLACK MASK patter mixed with the author’s own invented neo-noir 1930’s jive. At times I’d laugh out loud–PAGES further into the story–it having taken that long, in the rush of the tale, to realize that I’d been HAD, taken in by a phrase or description I’d never seen before, but one that sounded absolutely right.